View of the court room of the Bank of England. The room has an elaborate stuccoed ceiling with panels showing classical patterns and motifs. There are small reliefs of classical scenes on the walls. At one end is an arcade, and to the left are large arched windows, to the right are three fireplaces. 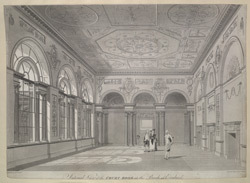 This room was part of the extension to the Bank built between 1767 and 1770 by Sir Robert Taylor. Soon after in 1788, the Bank was again reconstructed, this time in the neo-classical style by Sir John Soane.